New Release. Price £925.00 + FREE Mainland UK Delivery. It is always fascinating to re-discover vintages of Cristal that have been left to mature in the cellars after being disgorged. 8 years after its disgorgement, the Cristal Rosé 2002 is still bursting with fresh, fruity aromas. It is complex, multi-dimensional and reveals a variety of nuances. The bouquet is intense, powerful and incredibly youthful. Its soft, smooth notes of fresh fruits and candied citrus intertwine with more floral notes such as rose as well as smokey notes, cocoa, spice and cinnamon. The wine is juicy, fleshy and succulent on entry. Dense, concentrated and powdery texture with a smooth, juicy mouthfeel, chalky freshness and a saline finish that gives it a distinctive, ethereal, long and very pure style. Over the years Louis Roederer has developed a unique technique for the production of its rosé champagnes. This process, referred to by Roederer as the ‘infusion' technique, allows us to bring out the juicy, ripe character of the Pinot noirs whilst preserving their exceptional freshness. A small amount of Chardonnay juice is added to the Pinot noir maceration which then ferment together and integrate smoothly and harmoniously. 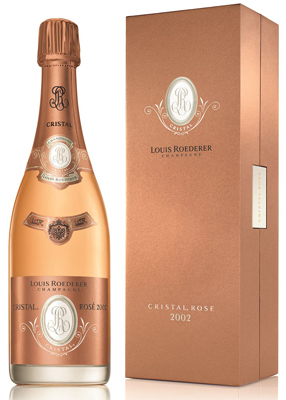 Cristal Rosé 2002 was aged on its lees for 7 years before being matured for a further 8 years in bottle after its disgorgement in 2010. An extraordinary year with all the qualities of an exceptional vintage in Champagne: consistently warm temperatures yet without excessive sunshine or heat, a particularly mild winter, slightly less rainfall than average during the growing cycle (20% less), cool nights and a cool, dry northeast wind in August and September. These exceptional conditions resulted in optimum ripeness levels in the grapes and good concentration of flavour. The harvesting began on the 12 September for the Chardonnays which were displaying an average sugar concentration of over 11% in natural alcohol.